If you’ll forgive me a rather self-indulgent post, the neck-anatomy paper that I and Matt recently had published in PeerJ is important to me for three reasons beyond the usual satisfaction of getting a piece of work out in a good journal. Taylor and Wedel (1023:figure 4). Extent of soft tissue on ostrich and sauropod necks. 1, ostrich neck in cross section from Wedel (2003, figure 2). Bone is white, air-spaces are black, and soft tissue is grey. 2, hypothetical sauropod neck with similarly proportioned soft-tissue. (Diplodocus vertebra silhouette modified from Paul 1997, figure 4A). The extent of soft tissue depicted greatly exceeds that shown in any published life restoration of a sauropod, and is unrealistic. 3, More realistic sauropod neck. It is not that the soft-tissue is reduced but that the vertebra within is enlarged, and mass is reduced by extensive pneumaticity in both the bone and the soft-tissue. First, it brings a drought to an end. For one reason and another, I didn’t get a single paper published in 2012 — my last hit was the neck sexual-selection paper in September 2011, and I’d started to feel that I was drifting off into the distance a bit. Good to be back on the horse. Second, amazing though it may seem, it’s the first Taylor/Wedel paper (in either order). Matt and I have been collaborating in one form or another for more than thirteen years now (even if the first couple of years of that were just me asking dumb questions and him telling me interesting things). Along the way, we’ve shared the authorship of a few papers with other authors (Taylor, Wedel and Naish 2009 on habitual neck posture; Taylor, Wedel and Cifelli 2011 on Brontomerus; and Taylor, Hone, Wedel and Naish 2011 on sexual selection) but of all the many Mike-‘n’-Matt projects we’ve started, this is the first to make it out into the world. Third, and most important, it means that my entire Ph.D is now published. Chapter 1 (the sauropod-history review) was in the Geological Society dinosaur-history volume; chapter 2 (the Brachiosaurus revision) was in JVP; chapter 3 (the Xenoposeidon description) was in Palaeontology; chapter 4 (the Brontomerus description) was in Acta Palaeontologica Polonica, and now chapter 5 (neck anatomy) is in PeerJ. I’m pretty happy with the selection of venues there: I’m pleased to have had papers in JVP and Palaeontology even though I won’t be going back to either until they’re open access. Taylor and Wedel (2013:figure 1). Necks of long-necked non-sauropods, to scale. 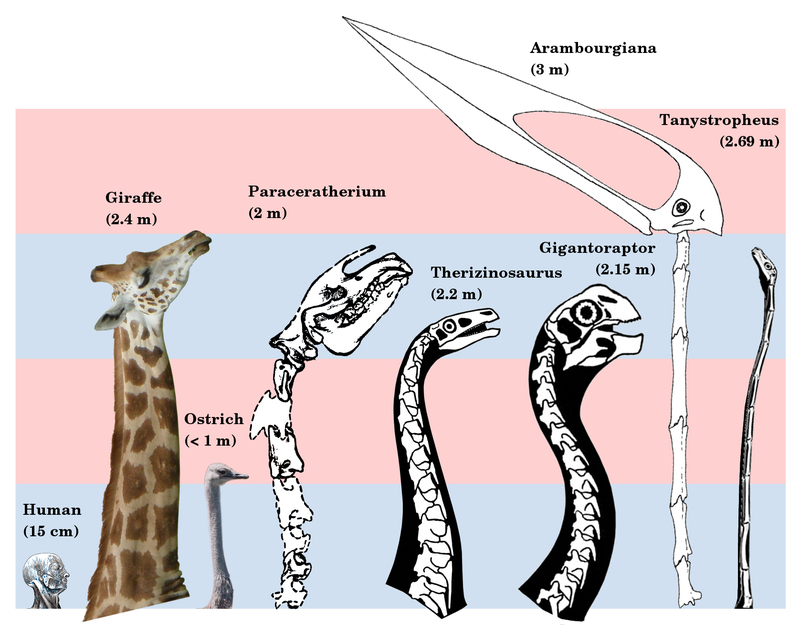 The giraffe and Paraceratherium are the longest necked mammals; the ostrich is the longest necked extant bird; Therizinosaurus and Gigantoraptor are the largest representatives of two long-necked theropod clades; Arambourgiania is the longest necked pterosaur; and Tanystropheus has a uniquely long neck relative to torso length. Human head modified from Gray’s Anatomy (1918 edition, fig. 602). Giraffe modified from photograph by Kevin Ryder (CC BY, http://flic.kr/p/cRvCcQ). Ostrich modified from photograph by “kei51” (CC BY, http://flic.kr/p/cowoYW). Paraceratherium modified from Osborn (1923, figure 1). Therizinosaurus modified from Nothronychus reconstruction by Scott Hartman. Gigantoraptor modified from Heyuannia reconstruction by Scott Hartman. Arambourgiania modified from Zhejiangopterus reconstruction by Witton & Naish (2008, figure 1). Tanystropheus modified from reconstruction by David Peters. Alternating blue and pink bars are 1 m tall. An oddity of my Ph.D is that all five chapters were side-projects. They’re all things that I worked on when I was supposed to be working on a core project to do with the Archbishop and the mechanics of neck support. Every one of them I thought would be a quick job that I could push out before returning to my main work. And every one of them “grew in the telling” until it was substantial enough to function as a chapter. I am sure there’s a moral to this story, but heck if I can figure out what it is. For reasons that seemed to make sense to me at the time, I did not post my dissertation on the Internet when it was accepted. I feared scooping myself on the as-yet unpublished material (Brontomerus and neck anatomy). Honestly, I don’t know what I was thinking. If I was doing it today I would certainly make it available from the moment it was okayed. As of just a couple of days ago it is now available — just in time to be of no interest to anyone. Taylor and Wedel (2013:figure 2). 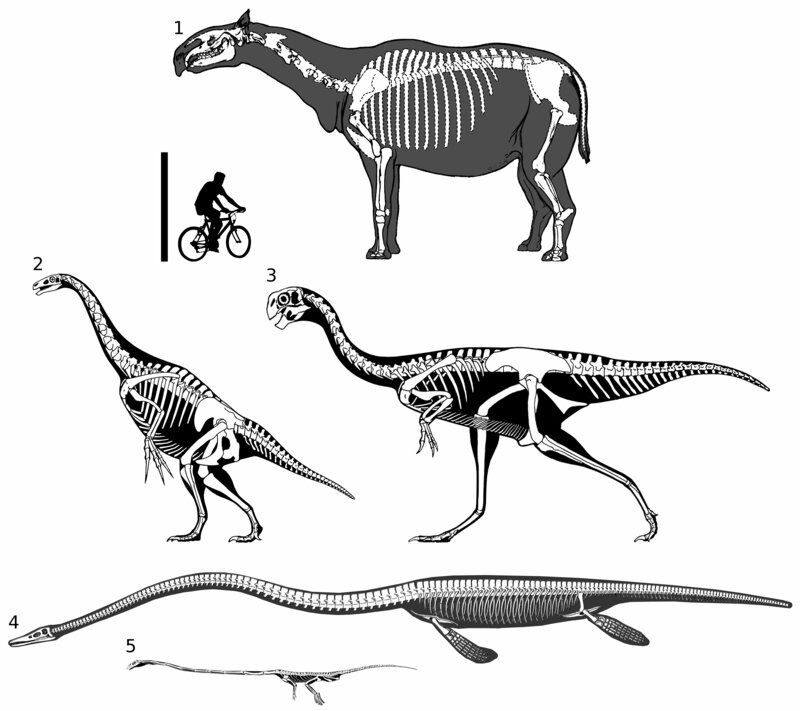 Full skeletal reconstructions of selected long-necked non-sauropods, to scale. 1, Paraceratherium. 2, Therizinosaurus. 3, Gigantoraptor. 4, Elasmosaurus. 5, Tanystropheus. Elasmosaurus modified from Cope (1870, plate II, figure 1). Other image sources as for Fig. 1. Scale bar = 2 m.
A final thing worth mentioning: as noted above, three of the chapters of my dissertation (Xenoposeidon, Brontomerus, neck anatomy) were co-authored. I think this is not particularly common, so it’s probably worth commenting on. Chapter 3 (description of Xenoposeidon): I was responsible for the anatomical part of the introduction, the systematic palaeontology section, description, comparisons and interpretation, phylogenetic analysis, length and mass calculations, diversity discussion, references, figures with their captions except figure 2, and both tables. Darren Naish of the University of Portsmouth was responsible for the geological and historical part of the introduction, the historical taxonomy section, and figure 2. Chapter 5 (evolution of long necks): this chapter was written by me as a consequence of a series of discussions with Mathew J. Wedel. Dr. Wedel also contributed figure 5. My sense was that the examiners were perfectly happy with this. Arguably it’s a good preparation for functioning as a researcher, since so many papers are co-authored. It’s not really realistic practice to sole-author all your work. That said, I doubt papers where I wasn’t lead author would have been welcomed. I mention this because co-authoring may be a more widely available option than is recognised. My advice would be simple: check with your own supervisor first! Congratulations! I finally got the first chapter of my PhD thesis published in December in the wonderful Theory and Application of Categories (“diamond” OA, or in other worlds, no-fee Gold OA). The chapters aren’t split precisely for publication, but there’s three more papers in there (or roughly; chapter 2 is a 70-page monster that needs a total rethink). Did you know that in maths people put their PhD on the arXiv? You can too! Whoops, make that “83-page monster”. Was longer than some of my fellow-students’ theses, but that’s partly due to inefficient use of space. Interesting to know you studied maths, Mike! I’ll look out for your thesis (today or tomorrow, I suppose). Papers should be as long as they need to be to tell their story clearly. One of the reasons I hate Science ‘n’ Nature is that everything published in them has to be compressed to the point of incomprehensibility to fit the very short length limits. If your work is 83 pages long, so be it. Presumably there are maths venues that, like PLOS ONE and PeerJ impose no silly limits. To be clear, the maths I studied was only to BSc level, and it was back in the late 1980s. Honestly, I couldn’t even tell you basics like what the axioms are that define a group any more. It’s pathetic. The dissertation I’m arXiv’ing is from my much more recent (2009) Ph.D in palaeo, and putting it up there is really a box-checking exercise since it’s already on my own site/. It may take a bit longer than a day, since I’ve had to request an oversize exception. Actually I only know of a few journals that do impose size limits, two in particular owned by the American Mathematical Society, and they have complimentary journals of equal status: one for short papers (<12 page) and one for longer papers. There are mathematics papers 100 pages long that get published with no worries. For instance: Andrew Wiles' famous paper on Fermat was over 100 pages long, and published in the most prestigious maths journal: _The Annals of Mathematics_. Papers in there tend to be longer, rather than shorter! Although we’re finally catching up, thanks to PLOS, eLife and PeerJ!